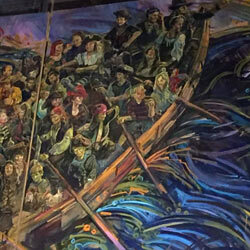 The Audience With Bannockburn is a massive painting celebrating the 700th anniversary of the Battle of Bannockburn. 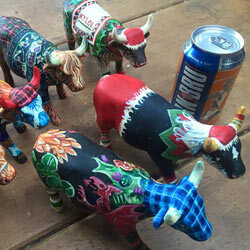 It was featured as the centrepiece of a groundbreaking storytelling festival in June 2014 at the Scottish Storytelling Centre in Edinburgh and has also been installed at the Battle of Bannockburn Visitor Centre in Stirling. The largest piece that I produced in 2011 was a commission for a restaurant in Glasgow’s East End. 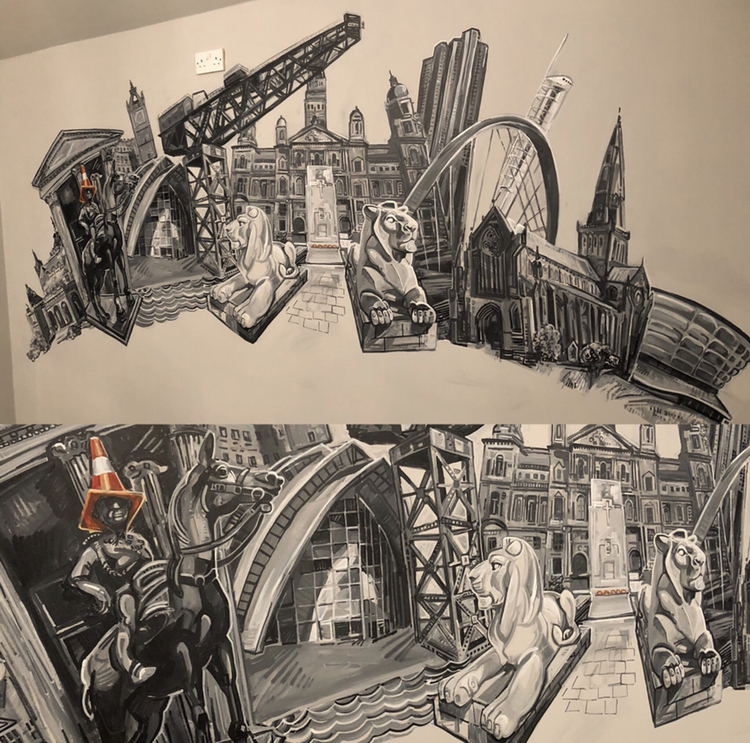 A continuous mural tells the riotous story of Tam o' Shanter venturing drunk into the wild and stormy night, spying on the devil's ceilidh (full of booze and bravado) and the epic chase once the revellers spy him. Blue Vale Structures boardroom mural gives their boardroom a quality new feel. Designed to be classy clean, reflect their Glasgow heritage and the dynamic forward looking nature of the company. The Big Wall project is a massive 60 metre long centrepiece mural that I built for the local community in Mayfield and Easthouses in 2014. One of the main goals was to involve the community in the actual manufacture of the picture, as well as featuring them in the content of the painting. In 2017 I launched a month-long project at George Watson’s College in Edinburgh, working with all the children from Primary Four through Seven. Drawing directly from the school’s curriculum, all of the year groups worked on murals with a historic theme, painting a Viking village, the Battle of Bannockburn, the Jacobite Rising, and World War II as seen through the eyes of evacuees. A Room in the West End is an Edinburgh bistro nestled below Teuchters bar, and owners Peter and John brought me in to create a crowd scene buzz in the space alongside an urban horizon that would make the subterranean room look bigger. We decided that alongside locals and staff, the crowd would be made up of Scottish celebrities, including musicians, comedians, actors, sportsmen and writers - a veritable who's who of Scottish sports and pop culture. 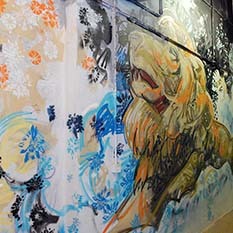 Take a peek at some of my recent murals. 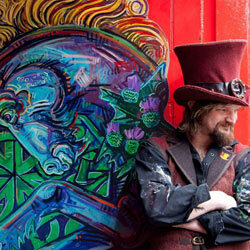 A recent departure from my brush-painted murals. 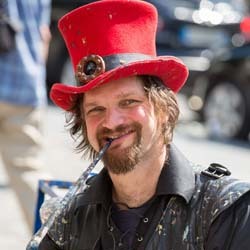 A bit of showmanship adds a dynamic element to painting. Enthusiastic and bearded. Sums it up really. 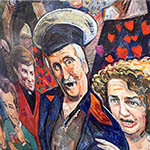 A Father Ted mural brings life to a new Irish venue in Edinburgh's West End. Late in 2017 veteran Irish bar owners Malones bought Edinburgh institution Diane’s Pool Hall near Haymarket station. After decades of running the legendary pool hall Diane decided to retire, leaving the much loved two-storey corner space open to new opportunities. On a personal note, I’ve been playing pool in Diane’s for more than twenty years and really loved the place, and so I was sorry to see it go. But I was delighted to receive the call from Malones and to help make this new incarnation a really special place was the best thing I could do.